The Gai Waterhouse & Adrian Bott-trained Wagga Gold Cup winner Stampede was too good again travelling to Brisbane to enjoy more black-type success in the 2017 BRC Chairman’s Handicap. 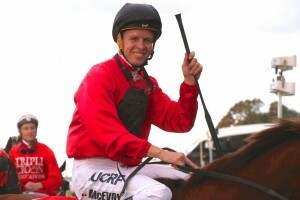 Jockey Kerrin McEvoy (pictured winning the 2015 Stradbroke Handicap) rode the favourite Stampede home on Doomben 10,000 Day in the Chairman’s Handicap. Photo: Daniel Costello. Enjoying his fifth career victory at start number nine, the four-year-old High Chaparral stallion was the clear favourite in the markets for Doomben Race 6 – the $125,000 Group 3 Chairman’s Handicap (2000m) on Doomben 10,000 Day. Going up two kilos to 56kg from the weight he carried to victory over the same distance in the Wagga Gold Cup just a week ago, Stampede handled the quick back-up with a classy all-the-way success in Brisbane. Ridden by Kerrin McEvoy, Stampede got across from his wide gate and took up front running after getting away well from the barriers. Stephen Marsh’s Kiwi raider Chocante settled into second just behind the leader, the four-year-old son of former Melbourne Cup winner Shocking debuting down under in the Chairman’s. Just off them in third was the Mick Price-trained The Chairman from Melbourne whose two lead-up runs produced two good thirds over the mile at Caulfield. Approaching the turn, jockey Brenton Avdulla moved The Chairman up into second to give chase to the hot favourite. Looming up to Stampede, The Chairman didn’t have enough to run down the top fancy with the favourite too tough saluting with a strong victory for the punters. The BRC Chairman’s Stakes results reflected the market order for the trifecta, Stampede and The Chairman followed home by Chocante. Eagle Farm’s $125,000 Group 3 Premier’s Cup (2200m) in a fortnight’s time on Kingsford-Smith Cup Day looks a nice next-up option for Stampede. To get behind this season’s Chairman’s Handicap winner Stampede in Brisbane next race at the right winter carnival odds visit Ladbrokes.com.au now.